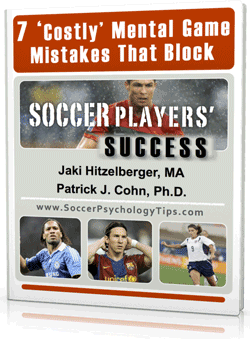 You are here: Home / Soccer Psychology Tips and Strategies / Soccer Psychology Articles / Do You Have Pregame Jitters or Anxiety? Do you consider yourself a nervous athlete? 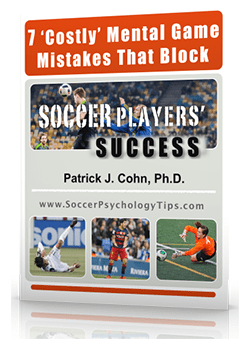 Do you become anxious about being anxious and fall apart during games? Many athletes believe they need to be totally relaxed when competing. When a little bit of nerves strike during the pregame, some ‘nervous’ athletes freak out. For the nervous athletes, just sensing some degree of edginess can create that ‘uh-oh’ feeling and cause them to spiral out of control. Contrary to the belief of many, nerves or edginess is not only good for athletes but necessary for optimal performance. When do nerves go from good to bad? The turning point is when an athlete gets over-excited, anxious, or worry. Not stepping on the gas pedal gets you nowhere just like an athlete who is totally relaxed or under-aroused. Flooring the gas pedal can cause you to feel fearful and out of control. There is an optimal “speed” that will produce the best results. Vancouver Whitecaps defender Christian Dean recently made his first Major League Soccer start since Aug. 29, 2015. Dean was the third overall in the 2014 MLS SuperDraft but suffered a knee injury and a foot injury which halted his 2016 season. In his first game back, Dean admitted to some nerves prior to the match but knew that this feeling was normal and necessary to play to his potential. Some degree of pregame jitters means you are ready to compete. There is no definitive answer for all athletes. There is a range of arousal that propels an athlete to perform their best. One sign is how quickly your pregame jitters go away. If they stay with you during a good part of the game, you’re probably anxious. If pregame jitters go away in the opening moments of the game, it’s just common jitters. 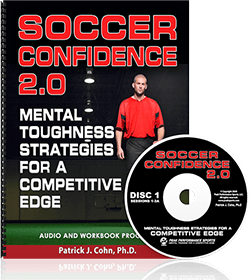 Once you understand your ideal pregame intensity, you will be physically and mentally ready to compete at your peak. Start rating your level of intensity, from 1-10, after each performance. A rating of 1 would mean totally bored or hard to get up for the game. A rating of 10 would mean freaking out and overly-anxious. Look for trends in your good performances and your intensity or edginess ratings. Many athletes feel they compete best somewhere between 5-8, but your range may be quite different. Once you know the ideal level of intensity, you can stop the snowball effect where a little bit of butterflies can turn into a stampede of anxiety. Also by knowing your range, you can develop strategies to amp up a bit or calm yourself down to keep you within your optimal range. It’s time to get those butterflies working for you!